Style and Performance without the Price Tag! As you browse through the reviews I have for you on my website, you will come across various models of faucet which range from the cheap to well, pretty expensive. I’ve done this because I like to think we live in a democracy and choice is what matters. For this review however, I’m aiming at those of you that are not necessarily that fussy about having something in your kitchen that’s got loads of “bells and whistles” you might not need. In fact, I’m going back to the good old fashioned 2 handle type faucet. Yes, one handle models are very popular these days, and if that’s what you’re looking for I have plenty for you to choose from. But for some, and I come across a great many customers who have this attitude, the idea of having a lever for cold one side and one for hot the other is something they prefer. So, let’s get on with my review on the Peerless P299578LF which has two handles (of course), comes in chrome and has a matching side spray. Well, there isn’t much to say except that if you want clean, modern lines this faucet is the answer. 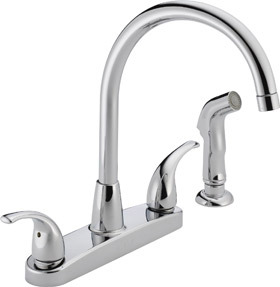 The spout sits between the handles and arcs nicely over the top of your sink. It also rotates which makes it much easier to fill large pots and pans. The handles are attractive to look at due to their ergonomic design and this also lends itself to ease of use. The side spray isn’t intrusive and will sit nicely on the side of your sink. It also makes for easy rinsing around your sink and will help make rinsing your dishes much simpler. It’s not just the price that will surprise you about this kitchen faucet, the manufacturer has also thought about how “green” this model is. It offers a flow of 1.8gpm (gallons per minute), is compliant with the California and Vermont low lead legislation, and meets the water efficiency standards as set out by CALGreen. This kitchen faucet is also ADA compliant but only if it’s installed properly. Although many people say this faucet is very simple to install without the help of a plumber, if you’re concerned about the ADA compliance I would recommend you get a professional in. You have to remember this faucet has been designed with budgets in mind. Whilst it will do a very good job at what it’s built for, you may find that if you live in a hard water area this model will not deal with mineral spots very well. It’s also susceptible to showing up fingerprints which means you might have to clean it more often. You do however benefit from the Peerless limited lifetime warranty. If you would like to find out more, and maybe take a look at what others have to say about this faucet, take a couple of minutes to check things on Amazon. 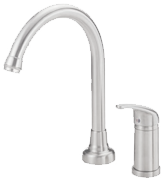 They often have great discounts which mean you can make this faucet even more affordable!